Neuralgia again. Or is it? I’ve written about neuralgia—nerve pain—before, but this time it’s different. In the past it has started slowly—the occasional subtle ping, gaining in intensity and frequency, rising to a crescendo of penetrating stabs, seconds apart, with little relief between. Then subsiding again over hours, or a few days at most. But this one has a different personality altogether. It strikes at random, speeds up and slows down at will. It can disappear for minutes on end, but as soon as I dare hope it’s gone, it’s back—tricked you! Conversely, it can cease just when I place attention on it. It can feel like a perverse, extended game of hide-and-seek with a toddler. I’ve become intimate with every bump on my skull, my fingers investigating and pressing every dent, every ridge, every ripple. 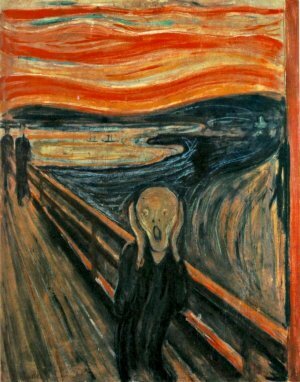 Picture Munch’s The Scream. Okay, not that bad, I don’t think I’ve screamed. Whimpered a little, moaned perhaps. But I’m thinking of taking up phrenology. 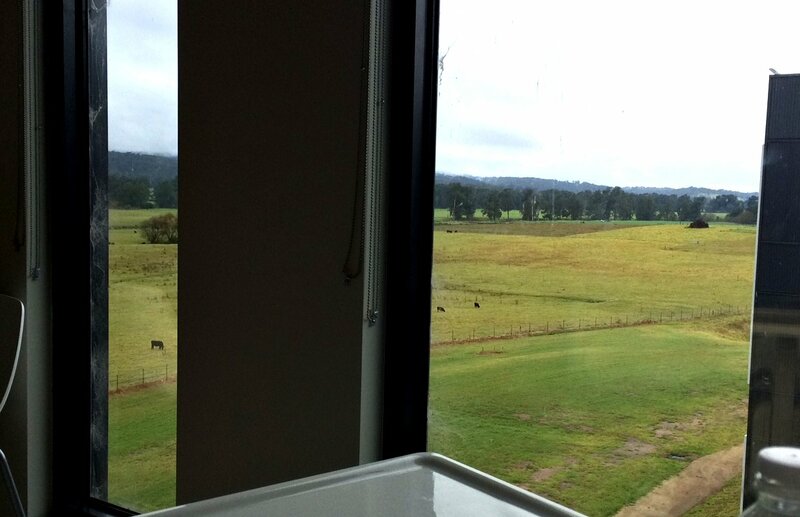 Anyway, at the peak of it on the morning of day nine, I gave in and let the Mechanic drive me to the hospital—the new Bega Hospital, a.k.a South East Regional Hospital, possibly the newest hospital in the country. Opened in April, it sits just out of town on the road to Tathra, a long, low, sleek edifice surrounded by pasturelands and glossy black cows. So, an opportunity to review the new facility. Wheeling along the expansive corridors feels like inhabiting one of those artist’s impressions of a futuristic arcade: all muted greys, soft corners, recessed lighting, floor-to-ceiling windows. And space. So much space. The elevator doors glide shut, and whisper open seconds later on a different floor, after no sense of movement at all. In the old, mid-century Bega Hospital only one of the two lifts was in use—the other had been long repurposed as a storeroom—and it seemed to take minutes to heave, knocking and scraping, between floors. Each two-bed ward has its own well-appointed bathroom. The toilet tissue pulls from a sealed dispenser in individual, silky, absorbent sheets. As do the paper towels beside the basin—no more retracting loops of flannel yanked from a growling metal box. The meal trolleys may whirr instead of rattle down the corridor, but the trays still offer the same dishes from State Slurries or whichever centralised galley boils, mashes and coddles hospital food these days. And perhaps I could have predicted it, but “Clive of India Premium Quality Blend Tea” does not the best cuppa make. Even after twenty minutes’ steeping, the colour’s that of weak pee, the aroma not much better. To be fair, it might brew better in hotter water. Lucky for me the Mechanic delivers tasty home-prepared supplies so when the caterers’ trays arrive and I lift the covers my interest is purely academic. As with the old hospital, it’s the staff that make the place. Last time it was the nurses on the High Dependency Unit. This time, two standouts hold my affection: Dr Sam in Emergency and nurse Victoria in Medical. Sam—horn-rimmed specs, long hair, intense but quiet concern for my discomfort. I could see him staring at the computer, clicking, typing … typing, clicking … padding over to my trolley in his sneakers to share with me an idea, a theory … padding back for more insights. No regular headache, this. We tried one drug, a second one, a third … no dice. It was getting late. He admitted me and sent me to Medical Ward with a note suggesting the opiate Fentonyl. Up there, Veronica on night duty alarmed me at first with her brusque response to my query about noise—’People think hospital is a place of rest. It’s not.’ But our long, hushed, meandering conversation in the predawn warmed and comforted me. On day ten, in desperation, I agreed to try the Fentonyl. It worked. But later I was dozing in bed when I heard a vacuum cleaner bumping around, and a voice saying, ‘Sorry, a bit noisy for a while’. In my fugue, I thought I was at home. I fumbled around for the name of our cleaner, but couldn’t remember it. Damn this drug, I thought. Later the Mechanic turned up (with dinner) and, relieved to be thinking clearly again, I told him of my embarrassment that I’d forgotten the woman’s name, and that I’d been in bed when she arrived. It’s never dark or silent on a hospital ward. There’s always dim light from the corridor, and muted, thin beams from nurses’ torches. Occasional chimes from patient call buttons, followed by the soft squeak of rubber soles on linoleum, conversations of varying volume. The snuffles and rustlings of the room-mate behind the curtain. I used these hours of wakefulness to work on a new technique. I’d do a ‘body scan’. I’d move my attention slowly from the tips of my toes up, resting on each part—the pad behind my toes, arch of the foot, heel, ankle … lower back, waist, shoulder blades … When I was truly focused I’d feel a mild sensation—a tingle or buzzing, a sprinkle of charged glitter. I’d pause and wait for this at each point. Then, by the time I reached the crown of my head, the pain would be gone. It’s arduous, and it’s not a solution; to hold the pain at bay I had to maintain concentration at that point, the crown, the tingle there increasing in intensity until it was almost an ache itself. Because as soon as my attention wavered … thwack! The pain would be back. The ultimate Zen master’s stick. This entry was posted in Author/Contributor, Jen Severn. Bookmark the permalink.